I have a turkey, big and fat. He spreads his tail and walks like that. His daily corn he would not miss. Ready to learn hundreds of signs with your baby? Our baby sign language kits contain all of the signs to help your baby overcome nocturnal fears and anxieties. Volume III of the Baby Signing Time collection available in our Premium and Ultra Kits comes with songs appropriate for bedtime routines. The Standard Baby Sign Language Kit, bundles together everything you need to get started with signing in one box, at a steep discount. The kit includes: (1) Baby Sign Language Guide Book; (2) Baby Sign Language Dictionary: (3) Baby Sign Language Flash Cards; and (4) Baby Sign Language Wall Chart. Your baby signs to your complete satisfaction, or you get a full refund. No questions. No time limits. No regrets. • Quick Start Guide – learn the first 10 signs and the basic principles required to start teaching your baby to sign (Chapter 1). • Advanced Teaching Methods – use teaching aids like books, flash cards, and toys to keep lessons interesting and challenging (Chapter 5). • Phrases – teach your baby to combine signs and communicate more complex thoughts (Chapter 6). • Taming the Terrible Twos – reduce frustration and tantrums by enabling your toddler to communicate (Chapter 7). • Transitioning to Speech – use sign language to expedite and improve speech development (Chapter 8). Sarah learned her first 10 signs at six month and it made our lives much easier. Instead of screaming, she could tell us when she was hungry, thirsty, or tired. She learned another 50 signs by nine months and that was a blast. Now she is talking much earlier than the other children in her preschool and we think it is because of her signing. We can’t imagine missing out on all the little things she shared with baby sign language. Thank You! Rhymes are our first step to literacy. Through repetition your baby will learn how language works while improving his memorization skills. Learning rhymes helps your little one by giving him the capability to intuitively recognize syntax. Knowledge learned through memorization and repetition of well-known rhymes will also allow your baby to transfer principles of language formation to all verbal and social interactions. Additionally, rhymes equip little ones with a strong grasp of phonetics. We believe that combining rhymes with baby signs can further your baby’s understanding of symbolism and abstract concepts. When teaching our babies rhymes and the signs associated to each rhyme, we want to carefully select the signs we will use. The goal is not to teach the child a full translation of the rhyme into sign language. Instead, we are looking to emphasize memorable concepts such as objects or actions that are easy to understand and are highly relevant to the day-to-day activities of your baby’s routine. Red, yellow, green, blue, flower, tree, sun, sea. His name was tiny tim. I put him in the bathtub to see if he could swim. Turtle, tiny, bath, swim, drink, water, eat, soap, bubble. And stole it all away. At about six to eight weeks your baby will begin to have noticeable eye contact as well as emotional response to interactions with caregivers and those around him or her. Our response to their initial attempts to interact is essential to proper development and can give a baby a significant advantage over their peers. When it comes to teaching our babies proper response and helping them develop key skills baby sign language is one of the most effective and all-encompassing tools available to parents and caregivers. Life gets busy and we are pulled in all directions. It is not uncommon to find ourselves caring for our babies almost by inertia. Creating opportunities for interactions where baby receives our full attention is radically important. With this in mind a baby sign language routine will help you engage in a way that is highly interactive and places your full attention on your little one. Take a break from feeling overwhelmed and delight in watching your baby learn. Your baby will learn about the world that surrounds them through visual engagement. 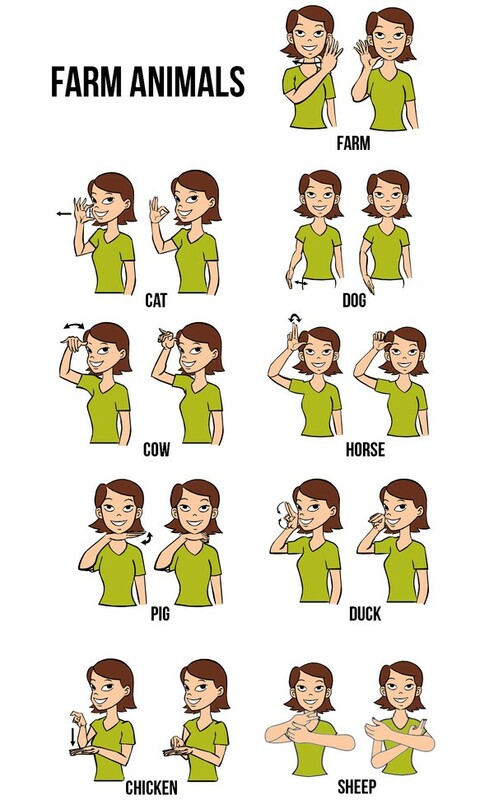 Baby Sign Language allows you to expose your little one to symbolic associations that can later translate in improved reading skills. Spend time showing your baby flash cards, model objects and signs. Through it, he or she will become more adept to learning complex ideas identifying categories and developing a better response to visual feedback. Babies who are not held and nuzzled and hugged enough will literally stop growing and-if the situation lasts long enough, even if they are receiving proper nutrition. Touching matters more than anything. Through modeling signs you have the outstanding opportunity to touch your little ones and guide them through the process of learning. Baby sign language equips your preverbal child to convey essential needs helping you to respond with more expediency. Through it your baby begins to know that he can rely on you increasing the emotional bond and giving him a sense of security. In his 1985 book Solve Your Child’s Sleep Problems (revised and expanded in 2006), pediatrician Richard Ferber introduced a method of getting children to sleep that has become known as “Ferberizing” or Cry out method. To put it briefly the method consists in allowing the baby to cry briefly before providing comfort. The cry it out method is usually implemented when baby is ready to sleep all night long. This normally happens between month 5 and 7. Stay out of the room for a little bit longer than the first time and follow the same routine, staying out of the room for gradually longer intervals, each time returning for only a minute or two to pat and reassure him, and leaving while he’s still awake. Follow this routine until your child falls asleep when you’re out of the room. How long should I leave my child alone? First night: Leave for three minutes the first time, five minutes the second time, and 10 minutes for the third and all subsequent waiting periods. Second night: Leave for five minutes, then 10 minutes, then 12 minutes. Make the intervals longer on each subsequent night. Your baby might be crying because he went to bed hungry. Signs like milk or water can help your baby quickly communicate the trigger to discomfort when he is heading to bed. Your baby might have a wet diaper. Signs like diaper can help alert you of the need for a diaper change. Your baby might be cold or warm. Signs like cold, hot and blanket will equip your little one to convey an immediate need. Your baby might be feeling sick. Signs such as hurt will expedite your ability to provide your baby with the help he or she needs. There are many fans of the cry it out method. There are also many detractors. If you do decide that it is something you want to try consider teaching baby a few signs before you move forward. You can be certain that empowering your baby to communicate their needs will result in a happier and better adjusted little one. Ready to introduce baby sign language as part as their bedtime routine? Do you have a new baby and you want to get started on the right foot? I know we all love quick reference guides to help us practice the signs of the season. Let’s get started. 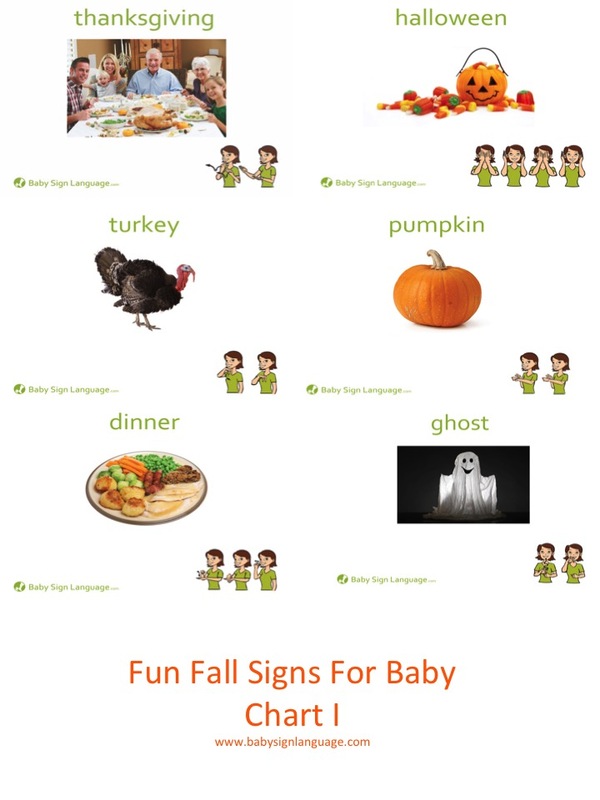 Together we can learn many signs useful during the fall holidays and all year long. Creating a positive bedtime routine is essential to avoiding nocturnal fears. Babies and toddlers thrive in settings and rituals that are familiar. Begin from birth choose words and signs that communicate what is about to happen and be consistent in providing visual and verbal queues. 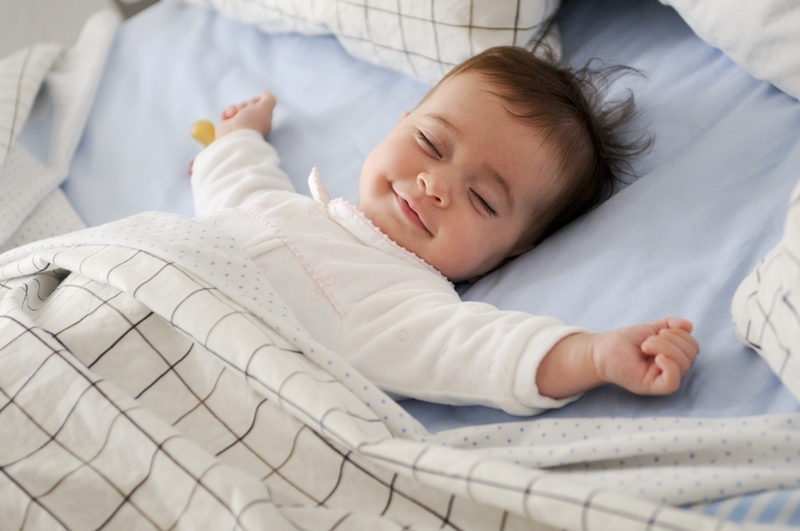 Do this even when you co-sleep, this way you will have some ritual that you can transfer once your baby is ready for their own room or their own bed. Even if your baby does not fully understand the sign and word associated to the sign, he or she will have a sense of continuity and familiarity if you stick to the same habits every single night. In our home we included the sign for sleep as the first clue that bedtime was near. We tucked baby in bed, read a small book and said a short prayer always incorporating a couple of familiar signs. Before leaving the room we made sure to sign good night and I love you. There is a certain universality to the types of fears babies and toddlers are likely to experience. Try teaching your little ones signs that are relevant to experiences that may trigger fear or a sense of discomfort as well as the potential solution. When we made our own list of signs to help alleviate nocturnal issues we included the following: Light, cold, scary, blanket, hungry, hug. If you have more than one baby quiet conveyance may be essential to a restful night for all. Teach your little ones to use baby sign language first to explain their concern. If you have a baby monitor and you have been consistent in teaching signs don’t be surprised if your baby signs specific things just before he or she wakes up from a nightmare. Make it a point to intentionally observe their sleeping behaviors to better address nocturnal concerns. There is something inherently calming about music. To help your child in developing a sense of security teach him songs or rhymes that include comforting words or sounds. If taught correctly you may find that your child comforts him or herself by singing their favorite songs and signing along. One of the most essential needs of humans is the need for acceptance and protection. Be consistent in signing basic signs that convey love and security. We always find it delightful when our child relaxes in response to the sign for love or the sign for pick up. We also allowed our little one to associate the sign for blanket with access to their comfort blanket. Are children more afraid when they sleep alone? It would be surprising if co-sleeping with parents didn’t reduce a child’s separation anxiety — a panic response arising from a primitive part of brain that also processes information about physical pain (Panskepp 2000). We should be mindful of the fact that almost always humans tend to overreact to emotional stimuli at the end of the day. Experiments suggest that the amygdala — a brain region that processes emotional events — becomes overactive when you are tired (Yoo et al 2007; Maski and Kothar 2013). Negative emotions may come naturally to us at night. Every baby learns differently as far as timing, learning style and preferences. Some of us start with basics like the sign for milk, more, mommy and daddy. But for some the list of starter signs is customized based on the child’s personal preferences and interests. I have met wee ones whose only passion is to learn every possible sign for all the animals in the zoo. I have also encountered food-driven toddlers whose fascination with crackers and cheese is something to behold; their persistence in getting their way through signing is certainly worthy of admiration. Not long ago I received a call from a sweet friend of mine whose gift is gentle and intentional motherhood. Marla has a way about her that makes people both curious and envious. Her babies are always the cleanest, most fashionable and best behaved children in the room. When Marla’s youngest was born I rushed to give her a Premium Baby Sign Language Kit. I knew in my heart she was going to make good use of it. She is after a super mom of sorts. Marla’s call, like everything she does was all about her wee ones. Marla had a story to tell me; and boy was the story good! So good, I asked Marla to write it down in her own words. Up until Charlie was born I used the printable resources on your website to teach my kiddos how to sign. We mostly used signs related to food and sleep. When you gave us the signing kit for Charlie’s baby sprinkle we became hooked on The Baby Signing Time DVDs. My toddler and preschooler asked for us to watch the DVDs time after time. I started signing with Charlie from the moment he was born. His sister and brother would further reinforce the signs making it extra easy for Charlie to learn ( I guess that is one of the perks of being the youngest!). Charlie signed milk and more just a few days after his half birthday. By the time Charlie had his 1st birthday he had great curiosity for things like fans, lights, cars and keys. Keys in particular made him ultra happy. He liked real keys and absolutely loved his colorful teething ring. And keys are the reason I had to share this story with you. Last week Maddie fell while playing outside. She was bleeding profusely and needed stitches. Going to urgent care with three under five in two is not a laughing matter, and having one in tears multiplies the stress level felt by all. As I tried to get everyone together so we could head to urgent care I realized my keys were missing. Unfortunately, I only have one set. I searched high and low for my keys and felt utterly hopeless. As I walked around looking in drawers and shelves I must have muttered the word keys. I know I did because Charlie began signing “keys”, walked toward the sectional stuck his little hand between the cushions and triumphantly handed me the keys!! I know my story is simple and silly and speaks to the fact that this mama does not have her act together. I also know that seeing Charlie sign as he literally saved the day totally made my heart smile. I hope it makes your heart smile too. The weather is much nicer, state fairs are popping all over the country and many of us are planning visits to farms and pumpkin patches. Here is a nifty quick printable courtesy of our friend hellobee. There are no words to describe how much I love first birthdays. The deep sense of discovery, the sense of transformation and the simplicity and beauty of the celebration just makes my heart smile. Most moms share this sentiment particularly as it relates to our first baby. Planning smash cakes, learning to blow candles singing the “Happy Birthday” song and practicing how to open a present will fill the days and weeks preceding the big occasion. If you are ready to incorporate baby sign language to the pre-birthday preparations go ahead and print these cards. I know you will enjoy them as much as we do. Click on each sign to access the free printable file. Fall is a lovely season. It is a time of change and discovery lending all of us opportunities for learning and engaging with our little ones outdoors and indoors. If you are fortunate enough to have a toddler who is transitioning from non-verbal to verbal communication join us as we explore a few games, activities and signs that capture the very heart of the season. Say goodbye to swimming trunks, sunglasses & shorts and get ready to teach your baby new and wonderful signs that will empower her to seek comfort and warmth as needed. When you are ready to show your toddler new clothing suitable for the season make sure you prioritize comfort and fit. I remember our little one using the sign for hurt the first time she tried on a pair of hand-me-down boots. If your toddler is ready this is a great time to work on motor skills teaching him tasks such as zipper up and zipper down, button up and button down as well as put on and take off with clothing items such as jackets, scarfs and hats. This is also the perfect season to learn to wipe our boots or shoes before going inside. Learning this skill early will set the stage for a neat and successful winter. Among others, here are a few signs we can learn as we explore warmer clothing for the season. To sign sweater hands move down from chest to waist at the same time as if in putting on a sweater. To make the baby sign for coat take both hands and make them into fists with thumbs up. Move the two fists up and down in front of the chest. To sign scarf your hands will make the motion that mimics tying a scarf around your neck with a single knot. To sign gloves brush your fingers on your dominant hand, over your non-dominant hand. Then do the reverse, running the fingers of your non-dominant hand over the fingers of your dominant hand. The sign resembles someone putting on a pair of gloves. To sign boots you start by doing the sign for shoes, taking two closed fists and bumping them together. Then you open your strong hand and touch it on the inside of your weak arm’s elbow – as if to show that the boots come up high on your arm. This is perhaps the most beautiful part of the season. Observing change, learning about nature and discovering celebrations that will be the foundation of cherished memories. Our favorite toddler-friendly activity is also the simplest and most accessible to all of us. Walk outdoors and collect the gifts of nature. You can use leaves and seeds to create simple crafts and take the opportunity to teach your baby how to sign and say words relevant to the season. We love to make little collages using glue, paper and bits of nature. The leaf sign looks a lot like a leaf hanging from a branch, waving in a gentle breeze. Your weak hand acts like the branch. You point the index finger on your weak hand and make your other fingers into a fist. To sign seed use your dominant hand with all fingers pointed downward. Grab an imaginary seed and open and close your hand as in dropping seeds. To sign rain, open up both hands, and starting with your hands above your head and bring them down. Your fingers are like the raindrops drifting down. To sign stick both hands meet together at the center making two circles with thumb and index as if in holding a stick. Pull your hands out and away from your body. The sign for park is achieved by combining the sign for grass with the sign for area or space. This season lends us two magical opportunities for family and fun. Thanksgiving and Halloween are among the most memorable childhood holidays. Embrace the season and get busy teaching your little one family traditions and games that will stay in their hearts forever. There are so many seasonal activities related to the holidays we would not know where to start. We love making homemade candy and cookies and allowing our toddlers to do simple sprinkle-based decorations. We also set time aside to make turkey or pilgrim and native hats. The sign for Turkey looks like outlining the wattles on a turkey. Taking the index finger and thumb pointing down, move your hand from your chin down to your chest. To sign pumpkin your non-dominant hand goes into a fist and flicking it with your forefinger on your dominant hand. The sign is like you are testing the surface of pumpkin to make sure it is good. To sign candy take your index finger and touching it to the back of your jaw. Twist the finger back-and-forth. To sign halloween cover your face with both hands palms slightly curved and uncover your face right away as in playing peek-a-boo. To sign ghost have both hands meet with index and thumb, move the upper or dominant hand upwards while waving slightly as if a genie was coming out of a bottle. Your non-dominant hand remains still.